Teams that develop fundamental projects are faced with certain challenges: mainly these projects require a lot of specific theoretical knowledge and they are typically characterized by low immediate applicability. Therefore, first we had to rely on opinions and suggestions of other scientists. We turned to the biotech industry, realizing that a critical aspect of modern synthetic biology project is its applicability and potential influence to the overall development of biotechnology. We completed the investigation of the field by surveying the potential end-users of our SynORI system by reaching out to the hands-on laboratories around the globe. Fundamental projects require specific knowledge and are extremely tough to demonstrate to the society, not to mention the difficulty of collecting feedback from the lay public. With regard to that, we launched a bioart project "SyNbiosis", which aimed to gather scientists, lay public and artists to discuss and reflect on ethical, biosafety, social, and legal aspects of our project. We thought of many ideas to involve the public and integrate their concerns into our project but finally decided that an interactive bioart exhibition is something that has never been done before in the iGEM competition. In addition, we prepared a short guide for the creation of bioart exhibitions. This year we divided our integrated human practices work into two different segments. 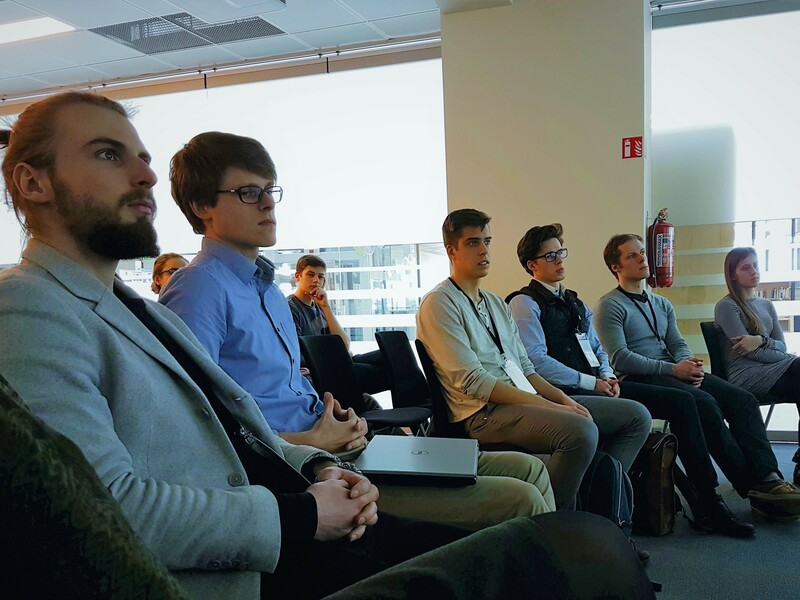 Firstly, we aimed to collect and integrate the suggestions of synthetic biology professionals from the academic community, biotechnology industry, and hands-on laboratories into our project. The second work focused on finding an appealing method to present our fundamental project to the community. The method was intended to be both public-friendly and efficient in providing society's feedback to us. Teams that develop fundamental projects are faced with certain challenges: mainly these projects require a lot of specific theoretical knowledge and they are typically characterized by low immediate applicability. Therefore, teams must first rely on opinions and suggestions of other scientists. laboratory of protein-nucleic acid interactions. scientists from the laboratory of biochemistry and molecular biology suggested that antibiotics do not always secure plasmid loss during the cell division and we therefore realized the importance of improving our system's stability, especially concerning a low copy number plasmid inheritance. This led to the development of an active partitioning system based on Par protein action as an integral part of the SynORI system. scientists from the laboratory of molecular microbiology and biotechnology advised us on the construction and verification methods of the RNA I - RNA II interactions for building compatible plasmid groups. We integrated their insights into our project by successfully building five unique RNA I - RNA II pairs. scientists from the laboratory of protein-nucleic acid interactions gave crucial advice on managing and optimizing our workflow, which helped us to plan our project timeline. It allowed us to adjust and model our work with more flexibility which also became reflected in the flexibility of the SynORI system itself. After receiving valuable insights from scientists at our home university, we turned to the biotech industry, realizing that a critical aspect of modern synthetic biology project is its applicability and potential influence to the overall development of biotechnology. The laboratory members suggested a target number of plasmid groups for our experiments. Together, we discussed the potential applications of the multi-plasmid system. This allowed us to purposefully design and model our system. 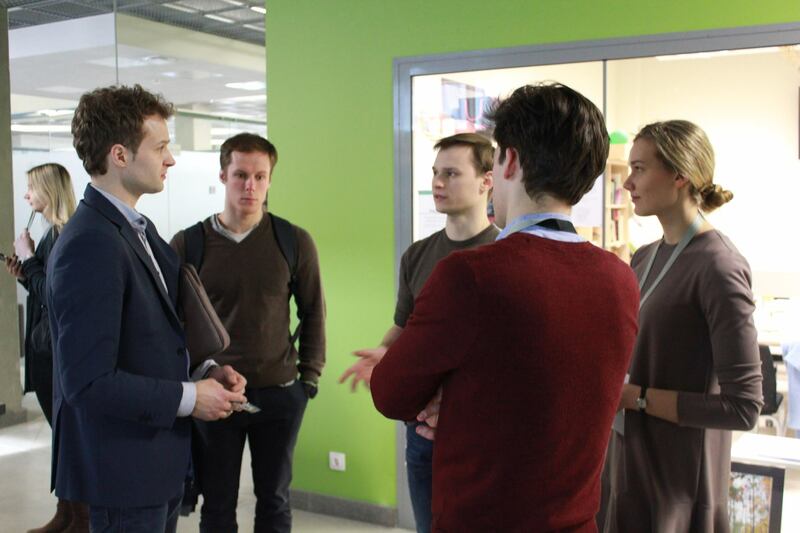 Although the experts in the sector of biotechnology provided us very useful information, we wanted to complete the investigation of how exactly we should build our SynORI project by interacting with the hands-on laboratories around the globe. We completed the investigation of our field of exploration by surveying the potential end-users of our SynORI system. To do this we reached out to various hands-on laboratories around the globe. 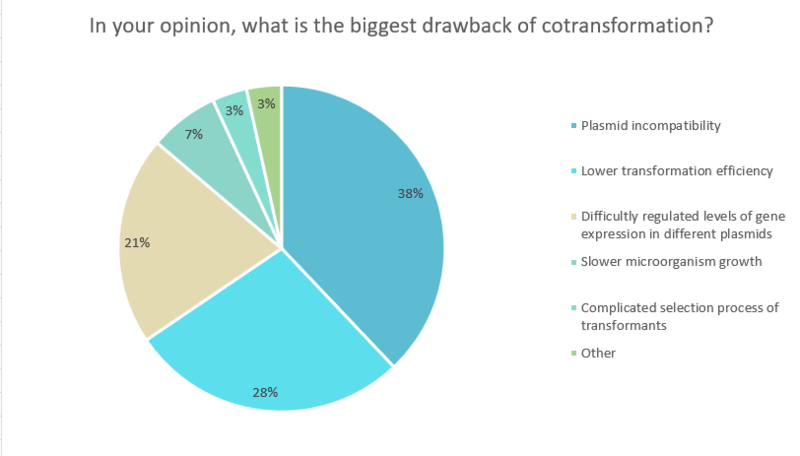 Respondents named plasmid incompatibility to be the major disadvantage of cotransformation process. 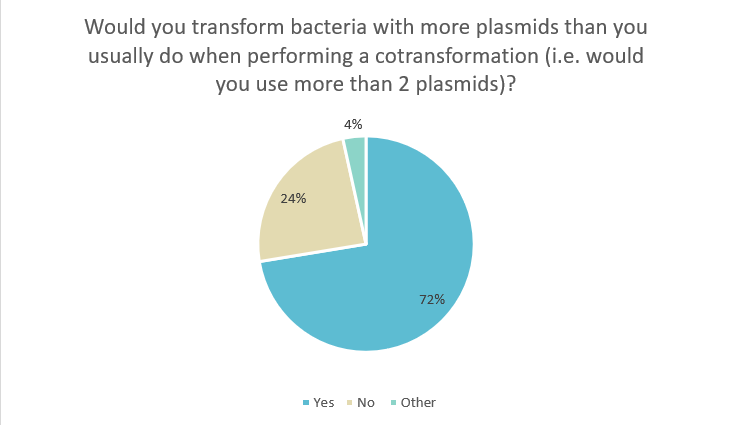 The majority of respondents agreed that they would transform bacteria with more plasmids than usual if a system enabling plasmid compatibility existed. 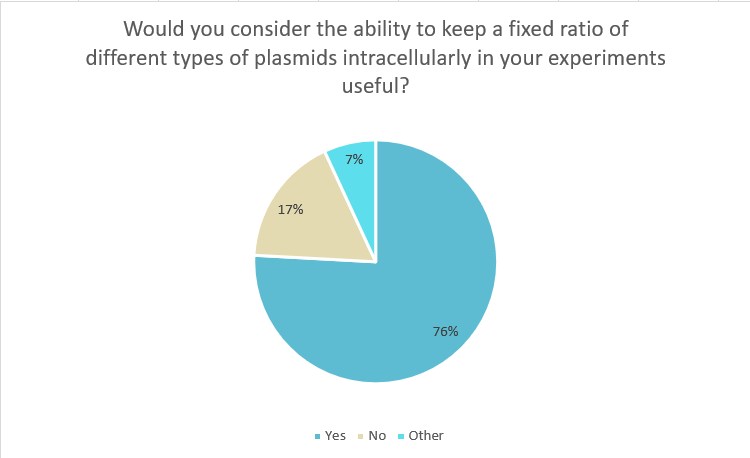 75.9% of respondents confirmed that an ability to keep a fixed ratio of different types of plasmids intracellularly would be useful in their experiments. It provided us a critically important feedback on one of our main project goals. As we planned to make a system for multi-plasmid cotransformation, we focused some survey questions on biosafety. We wondered, whether different laboratories tried to avoid the usage of multiple antibiotics. More than 95% of surveyed scientists use antibiotics to select transformants. They mostly used a combination of two antibiotics, however 6.9% of respondents used more than 3 antibiotics for selection on regular basis. It corresponded to the number of different plasmids in their experiments. 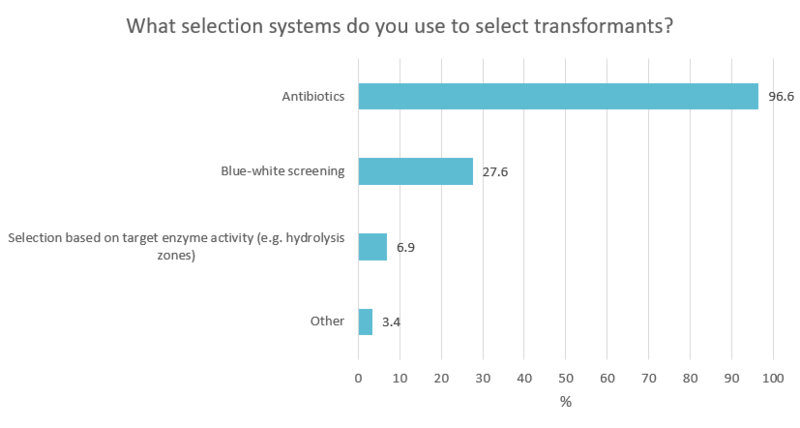 Most of respondents did not try to find an alternative to antibiotics by using another selection system. All respondents agreed that they would use another cotransformants' selection system, that could decrease the usage of antibiotics. This has prompted our focus on creating an improved selection method for multi-plasmid systems. It is therefore obvious, that our SynORI project benefited much from involving the local scientists on the scale of technical and environmental issues, as well as it was both approved and improved by three dimensions of biotechnology experts: academic staff, biotech industry and both local and international hands-on laboratories. Foundational teams need to consider wider implications of their project as well. Fundamental projects require specific knowledge and are extremely tough to demonstrate to the society, not to mention the difficulty of collecting feedback from the lay public. With regard to that, we launched a bioart project "SyNbiosis", which aimed to gather scientists, lay public and artists to discuss and reflect on ethical, biosafety, social, and legal aspects of our project. Synthetic biology is one of the most debatable fields of science which elicits both public's flair for incredible inventions and great fears of the unknown. Today, the advancement of this field of science enabled the synthesis of customized genetic elements and systems for various applications on an unprecedented scale. Contemporaneously, this raised a wave of critical reconsideration of the role and meaning of human creation itself. Synthetic biologists often refer to a famous quote by theoretical physicist Richard Feynman: "What I cannot create, I do not understand", but do we really understand what we create? In addition, synthetic biology raises many more similar questions. Are we satisfied with current definitions of life? Who is in charge to define the future of humanity? What are the boundaries between human and non-human agencies? Set along with the challenges of contemporary life, scientists are in a constant need to compare and contrast their definitions of creation, innovation and engineering of life with the public, specialists in the humanities, social sciences and arts. Therefore, we set a discussion which created an opportunity for collective thinking on the progression of synthetic biology and life sciences within the perspective of big themes of ethical responsibility, safety and future of humanity. We presented ethical issues and biosafety concerns relevant to the field of synthetic biology, the construction of synthetic life, and our project, as well as explained the importance of establishing a mutual partnership between scientists, lay public, and specialists of social sciences and arts. In addition to the lecture and discussion, we documented the experience and shift of minds of the participants by asking to express how they felt about our SynORI project before and after the event. We have learnt that on ethical and social grounds people mostly feared the reduction of the value of life itself. Almost equally important were the legal and environmental concerns of the domestication of nature. We have realized that all these issues apply to our project therefore extended the static investigation of ethical aspects of synthetic biology as we took it to the next level by setting up an interactive exhibition to embrace the mutual partnership with the society. We thought of many ideas to involve the public and integrate their concerns into our project but finally decided that an interactive bioart exhibition is something that has never been done before in the iGEM competition. Art is an universal mean of communication by which our team could simply explain the project to the public. People felt comfortable enough to participate as our artistic activities required no strict biological education. Participants expressed their feelings and ideas, which we integrated into the development of our project. [un]ethical. Interactive installation encouraged the audience to consider issues of engineering living organisms. The attendees were invited to express their attitude towards Gene editing, GMOs and Synthetic Biology by applying customised stickers on the wall. The size of the sticker indicated how in favour with a topic were they, while proximity revealed the fear of potential dangers.Further comments could have been added on the provided stickers. SynORI - a framework for multi-plasmid systems. 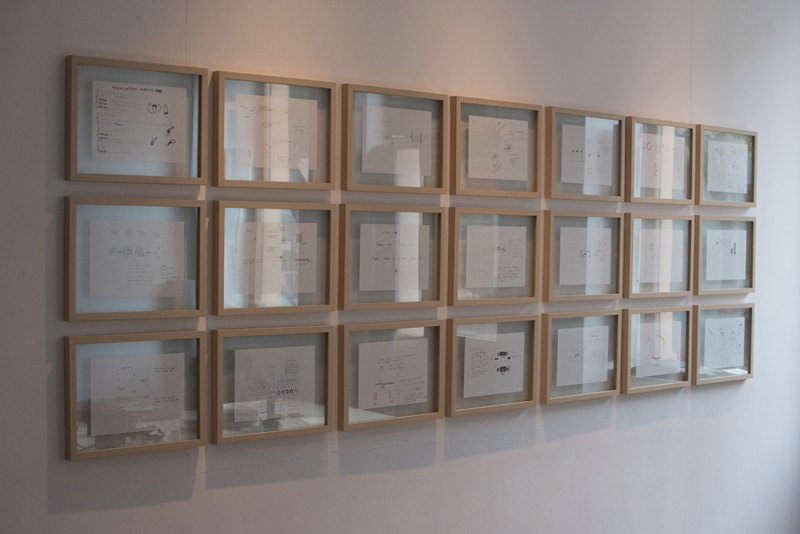 The series of drawings introduced the process of developing a SynORI - synthetic origin of replication. The lab. 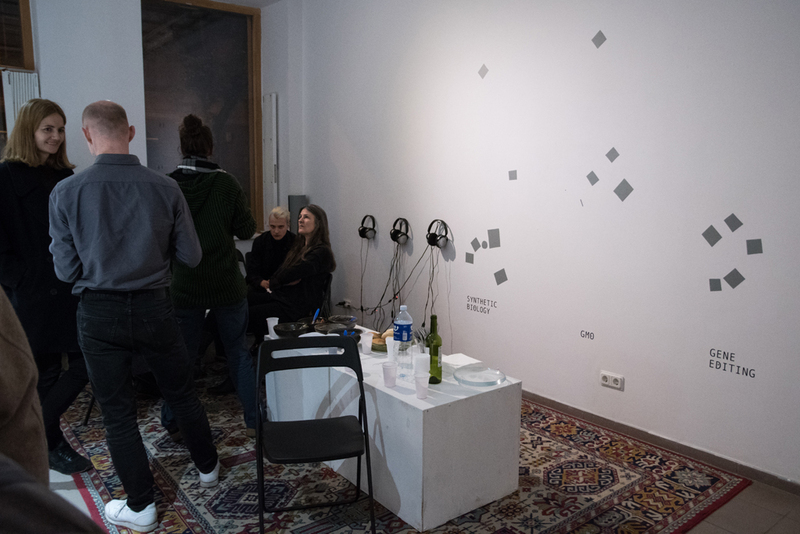 Visitors experienced the process of scientific experiment and daily life in the laboratory first-hand by interacting with auditory exhibits. The tunes allowed to create new associations with scientists and their daily routine. iGEM projects are not simply scientific works, but are also keen to involve and be relevant to the society. Our ethics and bioart exhibition activities provided insights, how fundamental projects, that deal with improving methods of construction of GMMs, should be presented and what concerns they elicit. 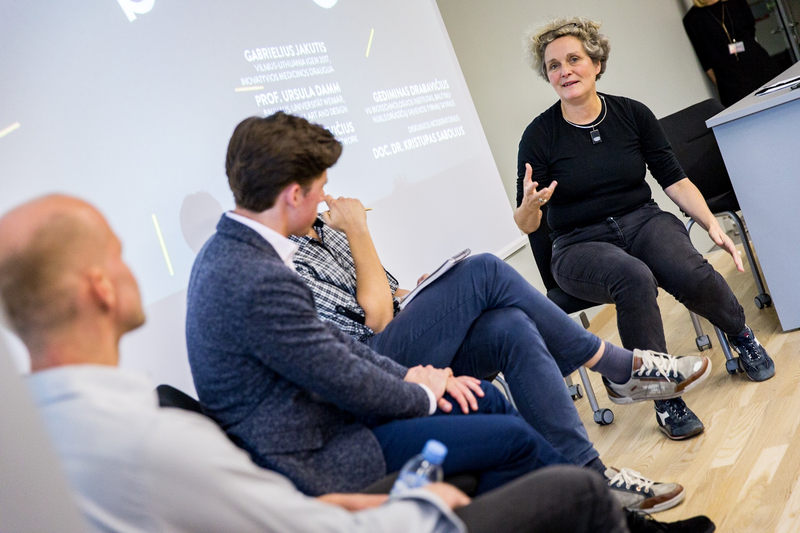 Our human practices made us more aware and socially sensitive, and we integrated this approach to our project making it more public-friendly and open for discussion to debunk the fears and myths of synthetic biology. It appears you don't have a PDF plugin for this browser, you can click here to download the PDF file.